This one has been LONG overdue. Join me in congratulating Leah C for earning the November 2018 GTS Athlete of the Month! Like many former college athletes, Leah lost her way after college. For 10 years she explored different avenues of fitness trying to find a good fit. She tried half marathons, yoga, group classes to no avail. With multiple knee surgeries under her belt, she was in search of something that kept her in shape, offered a challenge while avoiding injury and made her feel like part of a team again. Leah was referred over to GTS from a friend and she finally found the perfect fit. Leah is as coachable as they come, shows up, trains with focus and purpose, and her transformation has been incredible! Over the last 4 years, Leah has found her team, a sport she can compete in again, looks great, feels great, dropped body fat, increased lean muscle, and got REALLY STRONG in the process! 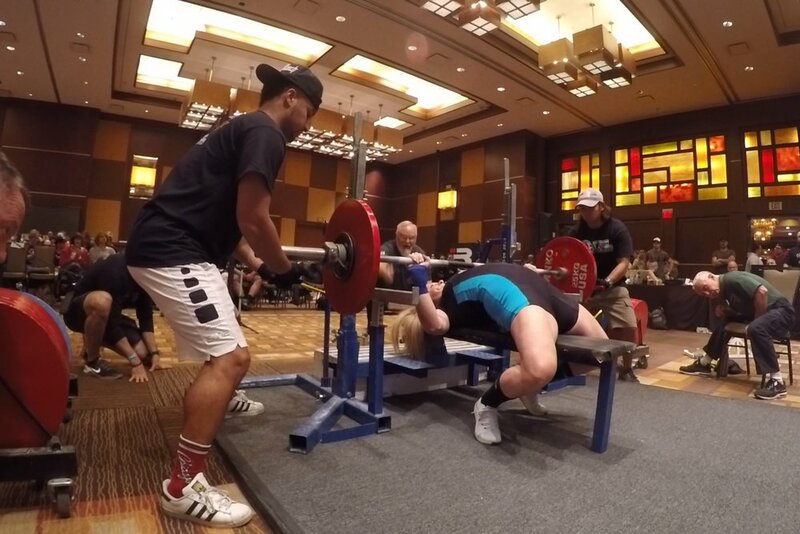 All of Leah’s hard work finally paid off when she qualified and competed at the IPL World Powerlifting Championships in Las Vegas this past November! She represented GTS as she went up against some of the top female powerlifters in the world! Leah’s strength accomplishments through the years! Her strength accomplishments aside, Leah has established herself as a team leader at GTS and her new found strength has resulted in a confidence that has carried over to all aspects of her life. She leads by example, brings a ton of energy to the gym each day and has become an inspiration to her teammates, friends, family and coworkers! It’s with great honor to award her GTS Athlete of the Month! It’s been an amazing ride so far, and we have a lot to accomplish still… really looking forward to see what Leah accomplishes in the future! Check out Leah’s story below! What was your background or story prior to GTS? I was a Division 1 college athlete, but focused training on my sport and didn’t do much cross-training. I always went to the gym, but basically did the same routines day-in and day-out. I (kinda) lifted, I tried to be a runner, and I even attempted to become a yogi… but I never saw any progress. Fast forward 10-years post college and few knee surgeries later, I needed to make a change in my fitness routine to see some change. I started with GTS in August 2014 and the rest is history! How long have you been training with GTS? What attracted you to the GTS Coaching system and why did you stick around? I love the support, the detailed coaching, and the fact that I don’t have to think about my weights/reps/training… I just need to show up and put in the work! What were the most helpful habits or rituals you started implementing in your day to day life to move you closer to achieving your goals? Always prioritize my training! Set up my work and general life schedule to include my training so I never have an excuse to miss a training session. 369 lb deadlift, 831 lb total! What was the most valuable lesson you learned during your time at GTS? Always be coachable. The weights and reps and training log are set that way for a reason. Don’t try to over-train or under-train and you will hit your goals! What has been your biggest accomplishment during your time at GTS? Qualifying and competing at IPL Drug-Tested World Championships in 2018! What advice would you like to pass on to your teammates or new athletes on the path to improving their overall health, nutrition, and performance? Be coachable. Show up, do the work, and you WILL hit your goals. Any other comments or thoughts you want to share? I am beyond thankful for my GTS family. All the support, camaraderie, hard work and fun in the gym make it the best place to train!! Game Time Strength (GTS) is El Segundo’s Top Rated Personal Training and Group Training Facility (Yelp Reviews | Google Reviews). GTS offers a comprehensive training and nutrition coaching program designed to optimize movement, live lean and lift strong. The GTS Coaching System promotes proven, sustainable training and nutrition programs and habits that help our athletes lose fat, build muscle, reduce injury, improve energy and get strong! Interested moving better, building a sustainable training and nutrition routine, and getting strong? Schedule a free call and learn more about our risk free trial. GTS Clean & Lean Challenge Winners! Really proud to announce the winners of our 3 Week Clean & Lean Challenge that took place in Oct-Nov 2018! The challenge focused on building daily nutrition & training habits leading into the holiday season. We measured progress using a point system and had a bunch of fun bonus opportunities each week. It wasn’t a weight loss focused challenge, but we had a ton of success on that front. Interested in moving better, building a sustainable training and nutrition routine, and getting strong? 7 months of consistency has really paid off! Join me in congratulating Danny Ta for earning the October 2018 GTS Athlete of the Month! Danny joined up with GTS in April 2018. He has consistently shown up to the gym 3 days per week and performs his program with precision and an emphasis on form and technique. He has also gotten involved in 3 different nutrition and training related challenges (GTS Reverse Diet, GTS Total Health Challenge, and the GTS Clean & Lean Challenge). Danny just consistently showed up to the gym 3x per week, focused on moving well, made incremental habit based changes to his nutrition and has aimed to find balance with the things he enjoys in life! Over the last 6-7 months Danny has lost ~27 lbs (215 lbs —> 188 lbs) while building muscle, and improving both his mechanics and strength in the squat, bench, deadlift, and overhead press! When he’s not jacking steel, Danny enjoys photography and sampling all types of food, beer, and cigars! It’s been a fun ride so far, and we have barely scratched the surface of his potential… really looking forward to see what Danny accomplishes over the next 1-2 years! Check out Danny’s story below! I’ve always been fairly active in sports, whether it’s running (10k, half-marathons, or a marathon) or Muay Thai. I’ve done some weightlifting on my own, but I’d always get bored of it because of the lack of variety. What was your initial motivation to find a coach? There is a story about what finally drove me to find a coach. Feel free to ask me sometime! Basically, I realized that I lost a few steps, in terms of strength, and wanted to start putting muscle back on my frame. Instead of what I would have normally done (to back to 24 hour fitness and hit the weights), I figured since I was starting over again, that I would do it right. I would seek out a coach/gym that would help me to finally lift with proper technique so that I could get more out of my workouts! And not injure myself in the process. That last part was key for me. After my first session, I knew that I’d been doing it all wrong for a long time. And that’s ok! We’ve been making it right ever since. I expected to put muscle back on my frame. I didn’t expect my body composition to change as much as it did! it was definitely a pleasant surprise. The Yelp Reviews drew me to GTS. My only regret was that I didn’t start a year earlier when I first found out about GTS. The coaching was a huge reason why I stuck around. These guys really do give a lot of attention to everyone, addressing their needs and helping them with all the finer details from lifts to nutrition! Plus, the fact that the system works and I look and feel a lot healthier definitely didn’t hurt either. The most helpful habit was changing my diet. Incorporating leaner protein into my diet was a game changer for me. Also, I’m now a lot more aware of the food that I consume. With the nutrition program, it is a lifestyle change, but I feel it’s not very restrictive either. I feel like I “could” have my cake and eat it too, which helps to maintain my healthy eating habits. I’ve learned that it’s ok to mess up/fall off the wagon, as long as you know and understand what went wrong and make an honest attempt to get up quickly and back on the wagon. Be as consistent as you can in terms of workout and diet. It’s ok to fall off the wagon. Just get back to business as soon as possible! 2018 - Who smiles while deadlifting? Really proud to announce the winners of our 6 Week Total Health Challenge that took place in Sept - Oct 2018! The challenge focused on building a series of healthy nutrition, training and sleep/mindset related habits. We measured progress using a point system and had a bunch of fun bonus opportunities each week. You can get up to 10 points for each category or 30 total points per week (x6 weeks = 180 max total points). It wasn’t a weight loss focused challenge, but we had a ton of success as you can see below. 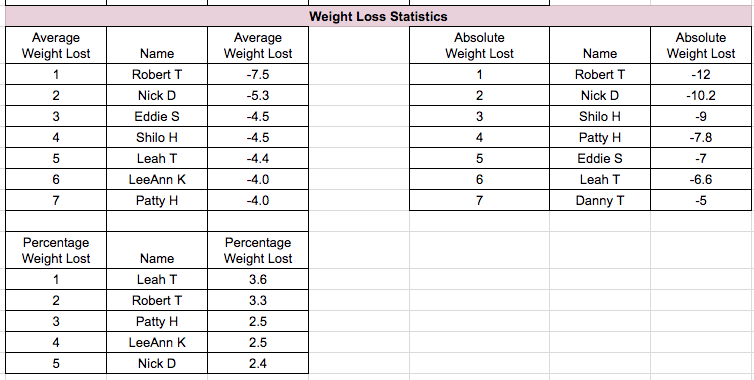 A video recap is below, as well as the weight loss statistics! Great job to everyone that participated in and completed the challenge! We’ll be announcing our next challenge soon! Interested in our next challenge? 2+ years of continued discipline, hard work and meticulous attention to nutrition, training, sleep and mindset is no easy task. Join me in congratulating Aidan Vosooghi for earning the September 2018 GTS Athlete of the Month! Aidan is a soon to be medical practitioner that absolutely walks the walk! He has been an immense source of motivation, inspiration and education to his friends & family as well as his coaching staff and teammates. Aidan is the perfect example of the slow and steady habit driven approach. Over the last two years he’s strategically gained ~25 lbs of muscle while keeping his body fat gain to near zero! In addition to his muscular development, he’s also significantly improved his technique and strength in the squat, bench, deadlift and overhead press! When he’s not jacking steel, meal prepping, or studying for medical school, he’s educating himself on all the current research and trends in fitness, nutrition, and human psychology. In September, he joined the GTS Coaching Staff to help implement the Total Health Challenge and share his extensive nutritional knowledge, health habits and tips for success with his teammates! It’s been both and honor and privilege to coach and work with this man and really excited to watch him leave his mark on the world! Check out Aidan’s story below! Aside from having an eight-year career in marching band, I wouldn’t call myself an athlete. For most of my life, I was pretty overweight and didn’t work out at all until I got to college. A friend of mine got me interested in lifting weights my freshman year and from then on, I was hooked on being able to see progress in the mirror and in the gym. I’ve been training with GTS since September 2016, so just over two years! When I reached out to Game Time Strength initially, I was looking for someone to teach me great technique in the competition lifts and to take my strength to the next level. They say “you don’t know what you don’t know” and I certainly had no idea how much I had to learn. From day one, I knew I was in capable hands, and immediately felt “part of the team.” The staff at GTS is knowledgeable in so many aspects of training and nutrition that you almost feel uncomfortable calling them “trainers”; they’re so much more than that. I never for a moment felt like I was just one client out of many. My individual needs were always addressed and aspects of my programming were tailored towards my personal goals. That’s pretty amazing when you consider how many athletes are coached by the GTS staff. Just as an aside, I can’t really express how much it meant to me when, on my second day, Jason told me I should sign up for a meet. As someone who never considered himself an athlete, I was startled by the suggestion, and my mindset changed entirely. I started calling myself an athlete then and never looked back. When I started treating myself like an athlete, I also started making training a non-negotiable part of my day. As I started to get more and more invested in my performance under the bar, I also began to appreciate how consistency in my other habits, such as nutrition and sleep, should also be non-negotiable. I’ve had so many amazing training sessions since I joined GTS, but I’ve also had ones that didn’t go entirely my way. Same goes with nutrition and sleep. Staying motivated and positive is easy when you’re hitting PRs every session. The coaching staff at GTS has taught me to find value in the lows as well as the highs, because long-term success comes from consistency. The lessons I’ve learned from being an athlete at GTS have not only contributed to personal records in the gym and improved body composition (those have been sweet), but also to my life more broadly. I’m a more responsible, more patient, more confident, and more helpful person now than I was in 2016. I believe that I am strong, I believe that I am capable, and I believe that I can do anything I put my mind to. As someone pursuing a career in medicine, there is no more helpful mindset than that. Believe in the power of consistency, don’t be afraid to ask for help, and learn as much you can. You’re not alone, you have so much to learn, and your hard work will pay off. Game Time Strength truly is a gem. They represent everything that you could possibly want in a coaching staff. The fitness industry is rife with people who either don’t know what they’re knowing, don’t care about you as an individual, or both. I used to drive 90 minutes twice a week in LA traffic to get coaching at GTS and would do it all over again. Nick has had a transformative year in both strength and body composition. After attending a GTS Barbell Workshop in Dec 2017, he committed himself to the GTS Remote Coaching Program performing most, if not all of his training out of his garage gym. Throughout the year Nick has made significant improvements in his strength and technique but really hit his stride over the last 12 weeks during the Reverse Diet Challenge. He meticulously tracked his calories and macros while balancing summer time social events. Over the 12 weeks, Nick’s calories slowly went from 2400 to 3000+ per day. Nick now plans to share his passion with others, develop his coaching skills, and recently began shadowing during the morning coaching hours! MUCH OF MY EARLY ADULT LIFE WAS SEDENTARY. PARTYING AND PLAYING MUSIC WITH EXERCISE LIMITED TO WALKING MY DOG A FEW TIMES A DAY. BEFORE GTS, I HAD BEEN LIFTING FOR ABOUT 4 1/2 YEARS. I STARTED WITH THE STANDARD BRO WORKOUTS FOR THE FIRST YEAR OR SO, NOT KNOWING ANYTHING ABOUT LIFTING. THEN I MOVED ON TO 5/3/1 WHICH WAS A GREAT PROGRAM THAT I WAS ABLE TO DO ON MY OWN AND MAKE DECENT PROGRESS. I HAD A COUPLE SUB PAR TRAINERS THAT WERE NOT WORTH THE MONEY OR TIME I PUT INTO THEM, SO I DECIDED TO FIGURE IT OUT ON MY OWN. EVENTUALLY I HIT A CEILING AND NEEDED A PRO AND DECIDED TO CALL JASON. I KEPT HITTING PLATEAUS AND PROGRESS WAS VERY SLOW - I WANTED TO GET STRONGER AND BETTER AT LIFTING WHILE IMPROVING BODY COMPOSITION. I WANTED TO ACTUALLY LOOK LIKE I LIFTED! I WAS REFERRED BY LOCAL LEGEND GORDON SANTEE. HE HIGHLY RECOMMENDED JASON, WHICH WAS ENOUGH FOR ME. IF YOU DON'T KNOW WHO GORDON IS - CHECK HIM OUT. HE'S A BIG INSPIRATION AND I USED TO GO TALK TO HIM ALL THE TIME WHEN I HAD QUESTIONS ABOUT LIFTING/SUPPLEMENTS AND NUTRITION… I HAVE STUCK AROUND BECAUSE IT'S A GREAT SYSTEM AND I'VE HAD A SIGNIFICANT PROGRESSION IN BOTH STRENGTH AND BODY COMPOSITION THAT HAS KEPT ME MOTIVATED. SOMETHING ELSE THAT HAS BEEN REINFORCED IS SELF MOTIVATION/DISCIPLINE- LOOKING WITHIN TO FIND WHAT MAKES ME WANT TO GET UNDER THE BAR DAY AFTER DAY, CONSISTENTLY AND WITH DETERMINATION TO BE BETTER EVERY TIME. LEARNING TO NOT PAY ATTENTION TO THE SOCIAL MEDIA NOISE - STOP COMPARING MYSELF TO EVERYBODY ELSE AND EMBRACE MY OWN JOURNEY. ABOVE ALL ELSE - CONSISTENCY IN BOTH TRAINING IN NUTRITION IS PARAMOUNT. AS CLICHE AS IT MAY SOUND - I AM IN THE BEST SHAPE OF MY LIFE. AT ALMOST 40 YEARS OLD I LOOK BETTER AND FEEL BETTER THAN I DID WHEN I WAS 18. I ACTUALLY LOOK LIKE I LIFT! I’M STRONGER, LEANER AND AM GETTING BETTER EVERYDAY. I’M SO GRATEFUL FOR JASON AND GTS AND I’M ALSO VERY PROUD OF MYSELF FOR FINDING THE DISCIPLINE THAT HAS MADE ME A BETTER, MORE CONFIDENT PERSON, FATHER AND HUSBAND THROUGH STRENGTH. CREATE GOOD SUSTAINABLE HABITS - THESE WILL CARRY YOU THROUGH THOSE TIMES WHEN YOU FEEL TOO TIRED OR UNMOTIVATED. LOOK WITHIN TO FIND YOUR FIRE AND TRY TO HARNESS IT. IT'S BEEN SAID OVER AND OVER AGAIN BUT IT'S TRUE: YOU GET OUT OF IT WHAT YOU PUT INTO IT. DO THE WORK AND STAY CONSISTENT. Going through some archives… here are just a few success stories and before and afters from the past!